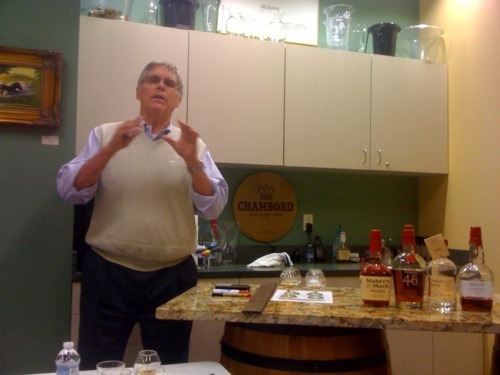 That was the simple-but-profound goal that led to his father’s development of Maker’s Mark, Bill Samuels Jr. said Tuesday night during a tasting at Westport Whiskey & Wine in Louisville (below). The only thing “wrong” with Maker’s, Bill Jr. said, is that it has a short finish. And so, about three years ago, he started pursuing another goal, one that would be his personal legacy: a bourbon that would intensify the flavors of Maker’s Mark – like “Maker’s on steroids” – and have a long finish, but with no bitter aftertaste. That’s a tall order. 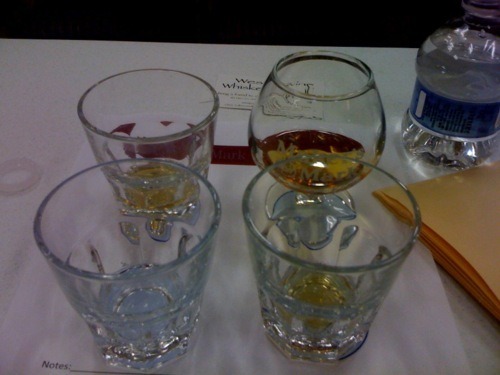 We next sampled some over-aged bourbon, bottom right; it had a longer finish, all right, but it burned. Bill and Master Distiller Kevin Smith conducted 113 experiments, and they all failed. He was ready to quit, he said, when Kevin suggested another course of action: “Why don’t we find someone who actually knows what they’re doing?” That someone was Brad Boswell, president of Independent Stave, which makes bourbon and wine barrels. After more experimentation, Brad landed on the idea of searing French oak staves before charring them, then adding 10 of these “flavor staves” to a barrel of 6-year-old Maker’s for a few months of extra aging. The result, top right in the photo, was Bill Samuels Jr.’s legacy: Maker’s 46 (this experiment was No. 46 in Brad’s lab book). It is, indeed, Maker’s Mark on steroids, with a bigger nose, a more complex flavor profile (cinnamon!) and a lingering finish – but no bitterness. “You’re waiting for that kick, and it never comes,” Bill said. He said a lot of other interesting stuff, too — if you know Bill, this won’t surprise you — but we’ll save that for another day.